78 million US dollars - that's how much the Government of Belize has to pay the Ashcroft Alliance, and Belmopan only has ten days to come up with it. That's the decision of Caribbean Court of Justice handed down today in the final case to settle the full compensation for the acquisition of BTL. It's a significant loss for the government, both tactically and in terms of hard currency - and you'll hear from the Prime Minister shortly. But, first to the decision which was handed down via teleconference from the CCJ Headquarters in Port of Spain at 9:00 this morning. The court was asked to determine, basically, whether roughly 160 million dollars that the Ashcroft Alliance through its companies, named Dunkeld and the Employees Trust claimed as legal expenses were justified. That figure comes out of the overall BTL settlement in 2015, but it's an amount that was set aside - what is called The Restricted Amount. This is the amount arising from the infamous Accommodation Agreement. Now, to be clear, the first half of the overall settlement was paid last year - and that's done with. This, now, is a decision to determine what happens with the second half, how much of it must be paid in US currency, and how much is in Belize dollars. That's because the government had originally said that this Restricted Amount would be put in a trust in Belize dollars and spent on charitable projects - after the Ashcroft Alliance took out its expenses. "The larger the amount of Dunkeld liabilities and Trust liabilities, the greater will be the US dollar payment to the claimants, and less will be available in Belize Dollars for the people of Belize. Unfortunately the settlement made no provision as to how these liabilities would be determined. Ideally there should have been an express provision for such liabilities to be determined by an expert auditor agreed upon by the parties with agreed terms of reference. No aspersions have been cast by the government of Belize on the professional competence and integrity of the international firm which had audited the actual liabilities incurred in connection with the compulsory acquisition. There's nothing to suggest any fresh independent audit would produce different results. So it would serve no useful purpose to order a fresh audit." "So the court orders the financial secretary on or before November the tenth, 2017, to pay Dunkeld the amount of US dollars 62 million 849 thousand, 799 and 23 cents ($62,849,799.23) representing 78,299,947.26 in US dollars." To be clear, the Government of Belize was ordered to pay Dunkeld $62, million 849 thousand 799 US dollars and the Employees Trust another 15 million 314 thousand US dollars - bringing the total to just over 78 million US dollars. Notably, the court levied no interest and awarded no costs. 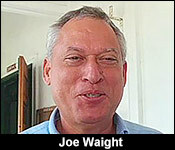 Now, Financial Secretary Joe Waight has to find that money by next week Friday - in US dollars. He was in court when the decision was handed down, and outside he told the press he is disappointed:..
"Your initial reaction at least?" "Disappointment. It's a disappointment, but we respect the court." "But, finding money, that's the important thing." "Well, you know, that's an order to the Financial Secretary, so we'll see how we can comply." "You have to find 20% of the reserves." "Perhaps a little more, we'll see." "How will this affect the country's finances? 80 million US in ten days?" "It's a lot of money, it's going to have an impact, it's going to have an impact, but we have to digest it and see, you know, exactly what, you know...we, we have an idea, but, you know, it will take some time." "Seeing now that it comes down to this. Was it all worth it sir? Because I mean the government has paid out hundreds of millions and now here's the last blow, a significant, a quarter of the reserves." "We have a duty to protect our interests.. You know? We have a duty, we have to go through, the, the, all stages. We couldn't just, we couldn't just leave it as it was. We thought we had a strong ground. We thought we had the high ground. The court saw it differently." Will Mega-Payment Wipe Out Reserves? But it's not so simple for the country hard currency reserves. Those should be at least equivalent to three months of exports - and making this payment will immediately wipe out 20% of those reserves. "These payments are not anything new. They are payments under the award, the quantum of which we've known for well over a year now. We do feel that the Belizean people have been shortchanged in that the amount of the funding of local projects is under $11 million, we had expected far more. We are still trying to understand how the Ashcroft people slipped the nose in terms of their being able to have the court approve the quantum that the court did as representing their liabilities. It is a fair deal of foreign exchange that we have to find but we can comfortably find it and that is the only sense in which it is of significance. It does nothing with respect to the budget, does nothing with respect to the fiscal position and in so far as it is important in the context of the central bank's reserves, those payments can and will be comfortably managed. At the end of the year, after we make these foreign currency payments to the Ashcroft people next week, in fact, our import cover will be 15.6 weeks, so we are comfortably above what is considered the safe minimum in terms of these international yardsticks." Later on you'll hear the Prime Minister address the issue more directly. But, first, to the main attorney for the Ashcroft Alliance, Eamon Courtenay. Today, after the judgement was handed down, he said the court was right to uphold his clients expenses - and now the Prime Minister has to answer for signing a settlement agreement that was full of holes:..
"This obligation of the government was established by the settlement agreement. The government was aware that they had to make the payment by the 28th of July." "Their issue was on the question of how much US dollars was to be paid. And the dispute between us really was whether they had a right to determine for themselves what liabilities of Dunkeld and the Trust they were going to honor. Now that is entirely unreasonable and the court has rejected that position advanced by the government." "Now there's a payment of about 78 million dollars by the 10th of November. I am told that's about a quarter of the current reserves of the country, that is a tremendous amount of money but there is a court order against the government, and my clients expect that they will obey the court order." "When the prime minister made the public pitch about the saving grace of the settlement, it was that there would be tens of millions in a charitable fund for the public good." "It is about 10.2, 10.3 million in the employees trust and a quarter million in the Hayward Charitable trust, so in terms of money available for charitable works in Belize, it is quarter million dollars." "Once again, Jules, the question here is who is responsible for this state of affairs? 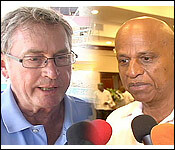 The agreement as you know was negotiated by the prime minister and Mr. Ashcroft themselves. And then lawyers went to work to put that agreement into legal language. 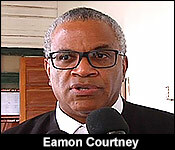 The CCJ, today, as well as they did before, have criticized the drafting of the agreement, and essentially what they are saying is that the agreement is not what the Prime Minister said to the public it was. Whatever he may have had in his mind is not on the paper. I can only say that that is his fault. He signed it; he read it before he signed it. 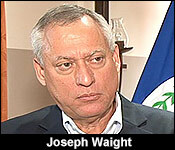 The exposure of the country today is squarely on the Government of Belize under Prime Minister Barrow. It is his agreement, this is not no old PUP agreement that he likes to rely on - this is his agreement. At the end of the day, however, the nation is being called upon to pay 78 million dollars, US dollars in ten days. That is a very, very difficult thing to do, but there is a court order and the Prime Minister who signed it is the Minister of Finance and he needs to come up and come up now." "I can tell you that, in fact, we will make the entirety of the foreign currency payments by the date given in the order of the court. The bottom line is we are going to pay these people everything by November 10th and so there will be no question of this 8.34% running. Already an informal approach was made to us to talk about the possibility of installment payments but then that's because then they would collect the interest from us. We will make one payment and be done with it and that's going to be an end to the saga in so far as the paying off for the nationalization of BTL is concerned." On November 11th, the governor of the Central Bank Joy Grant says there will be 15.6 weeks of import cover. "I think the court completely missed it. It wasn't just a matter of whether the liabilities put forward repressed expenses that were actually incurred. It was a matter of whether, even if these were expenses that were actually incurred, they were incurred so as to qualify them for reimbursement or for extraction in the context of what the settlement agreement provided for and in particular it said the expenses must have been incurred in connection with the compulsory acquisition of Telemedia. The expenses would not be allowable if they were expenses that were already before the tribunal and which the tribunal would have rejected." "The court absolutely did not conduct any exercise of that nature. It simply said we are prepared to swallow whole what these people have certified and the logical corollary to that is that the court then in a sense abdicated its function which is to determine were these expenses in connection with the compulsory acquisition, with your effort to get your compensation to go to arbitration and that sort of thing." "When we looked at the figures we saw things that in our view had occurred well before there was the compulsory acquisition." "The court also did not, as I said, seek to examine whether in fact a lot of what was being claimed had not been raised before the tribunal and not awarded by the tribunal. So, it is with great reluctance that I say what I say, but it strikes me that the judgement leaves a lot to be desired and the exercise that the court conducted or did not conduct certainly is caused, I think legitimately, for great upset on the part of the government and people of Belize. Nevertheless, that is their decision. We can't take it any higher, so we will pay these people as I said and be done with it." And while the Prime Minister is not happy with the court, as you heard both the judge and the Ashcroft attorney say - a lot of the problem lies in the settlement agreement, which the Prime Minister signed off on. Today we asked him if he accepts blame:..
"Do you accept any blame, any culpability for the defects, the much cited defects in the settlement agreement?" "Absolutely. Look, I didn't draft the agreement, but it turned out that the agreement was not the best drafted agreement in the world. Now, I don't know that there ever such a thing as a perfectly drafted agreement. That is why there are always court cases in consequence of disputes over the meanings of language in various agreements, but to the extent that there may be obvious boners in terms of this particular agreement and the particular wording. If I missed some as you called lacunae, then I will be perfectly prepared to engage in a mea culpa." "Were you outdone, outwitted by Mr. Ashcroft? It's you two who sat and negotiated the settlement. He has come out with half a billion [dollars] out of it." "Listen, Jules, what the Ashcroft Alliance has gotten is what the tribunal ordered them to get. I was trying to steal a march on them by insisting on the settlement agreement that provided for the accommodation agreement element of the award to be used in a particular way." "So that I wasn't able to get back out of that accommodation agreement element of the award more than just under 11 million dollars. I consider a matter of great regret, but you can't turn that into some victory for the Alliance. What they have ended up with is what the tribunal gave to them. You can make the point as you have that I did not ended up getting as much as I wanted to and as I felt I should have in terms of the amount for the Belizean people. But ultimately, it was coming out of what the tribunal had found belongs to the Ashcroft Alliance. You take the company, you have to pay for it and we always knew that." 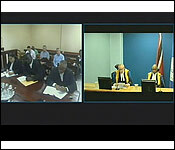 A release from the CCJ points out that the court is holding G.O.B. to tough terms if payment is not met in the prescribed timeline, thereby imposing an interest rate compounded on the existing amount on a quarterly or an annual basis. During his reading of the judgment, Justice Hayton provided a detailed breakdown, in dollars and cents, of the total that government has to pay. The drawing down on seventy-eight million U.S. dollars from the Central Bank’s reserves at this time of year raises serious concerns. Will the local economy be adversely impacted by the withdrawal of such a significant sum within a nine-day period? According to PM Barrow, it should not be a cause for worry since the funds are being held separately from the day-to-day monies being used to float the economy. He also provides assurance that the recent upturn in tourism numbers should provide an additional boost going into the end of the calendar year and that there is more than fifteen weeks of imports to cover the reserves. Yesterday Prime Minister Dean Barrow explained to the nation that the US $78 million that it was ordered to pay by the Caribbean Court of Justice before or on November 10, has been set aside. The Prime Minister shared that since they already knew the total amount that would be paid; this ruling will not add to the national debt nor put pressure on Belize’s foreign reserves. Barrow did express disappointment with regards to the amount of money that will be going to the BTL Employee Trust for charitable projects. But his disappointment does not change the fact that in its ruling, the CCJ criticized the Accommodation Agreement negotiation by the Government and Lord Michael Ashcroft. 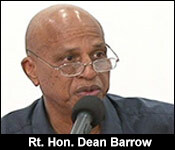 Yesterday PM Barrow accepted blame for how the Accommodation Agreement was drafted. Meanwhile, the People’s United Party issued a statement in which is condemned the Government for signing what it described as a ‘one-sided Settlement Agreement’. The PUP said quote, “This is an absolute disaster for Belize and it is now clear that the Prime Minister misled Belizeans about the supposed advantages of this deal.” End of quote. So, earlier in the week - the big news was all about the 78 million US dollars that government has to find to pay off the Ashcroft Alliance in a week's time. It's the final payment for the acquisition of BTL - so, that should put an end to 8 years of costly legal battles. The Ashcroft Alliance emerged with about half a billion dollars in compensation and you sort of get the sense, Lord Ashcroft wouldn't feel too bad taking a victory lap. But, not quite yet, because just when you thought this one was over - it isn't, not quite yet. That's because there's still the matter of the Sunshine Shares. If you don't remember those - don't feel too bad. That dates way back to 2005 when in another one of those special deals - Social Security loaned 10 million dollars to Sunshine Holdings, an Ashcroft company, under highly concessionary terms. Sunshine used that money to acquire shares in BTL. Well, when Government acquired BTL, they also acquired Sunshine's BTL shares. Now, government is saying that part of the compensation paid out to Ashcroft - has to go back to Sunshine - which, if you follow the logic, is sort of like the government paying itself. So, in order to get that compensation, Government would have to start a new round of litigation against the Ashcroft Alliance, which will have collected all the compensation by next week. "That compensation in your hands, Mr. Trust, you're holding that in trust for Sunshine. Because it doesn't matter that you owned or you had the shares in Sunshine at the time. Sunshine is a separate legal vehicle, and the compensation should be paid to Sunshine. Alternatively, even if the compensation isn't paid to Sunshine, you can't get the compensation for the shares, for which we borrowed money to buy, and leave us with the liability to pay back the investment loans. "So at the very least, we want you to pay back to Sunshine what was borrowed form SSB so that Sunshine can in turn pay. So, I said the saga is finished. The saga is finished insofar as GOB and the Ashcroft Alliance is concerned but Sunshine, my understanding is, will launch an action in the Supreme Court of Belize with that end in mind, to try to get the compensation or at least an amount to pay back SSB the money borrowed for the investment." This case will now start in the Supreme Court. A week ago, we told you how the Caribbean Court of Justice ordered the Barrow Administration to pay just over 78 million US dollars to the Ashcroft Alliance. That's after the Government lost the final legal battle over the settlement for BTL. The Government has until Friday November 10th to pay, or interest at a very costly rate will start accruing. But, for a cash-strapped government, coming up with that kind of hard currency isn't easy, since it immediately wipes out a quarter of the Foreign Reserves. "It has not been made. The order from the Caribbean Court of Justice was that the payment should be made on or before Friday, the 10th, and it will be made on or before Friday, the 10th. It will not be made today, possibly tomorrow." "We're told that this wipes out about a quarter of the country's foreign reserves, representing about 3 months of exports. How does this affect the country, and how will be built back up?" "It will not wipe out - it will reduce the reserves by about 20-25%. Remaining after that, will be about 3 months of import cover, which is fairly comfortable. Reserves are built over time, generally from surpluses between your exports and your imports. It will take time to rebuild, but it is in a positive direction because the balance of payments is largely in equilibrium, some months you're in, some months you're out. But, it's largely over a period of time, the current account, or the balance of payments, as it is called, your trade account is largely positive, and that over time - it will take some -and we hope that production remains, and prices remain. We have no natural disasters, but we don't use the reserves for day to day financing our trade activity. The reserves ...are just that, reserves." "Will the country feel any kind of effects for this 78 US million-dollar payment that is due by Friday?" "I am not sure what you mean by effects. Certainly, the balance remaining in the bank will be lower by 78 million dollars, but that will not create any shortages, or pressure on importers wanting to purchase foreign exchange for the imports because the system is largely in equilibrium, and they get that from their commercial banks in any event, not from the Central Bank." "How long will it take for the country to generate savings that that 78 million US dollars is replenished?" "That's a difficult question because it all depends on the level of your exports, how well your tourism is doing. Hopefully, you will not have any natural disasters. It depends on the price of oil on the world market, because those are our big imports, machinery, and things. It's a little difficult, I would figure about 2 years." If the Government does not meet the payment deadline, the 8.34% compounded interest kicks in, but as you heard, the Financial Secretary insisted that the Government would make the payment by tomorrow or Friday the latest. We'll keep watching. Last Wednesday, the Caribbean Court of Justice ordered the Government of Belize to pay US$78 million dollars to the Ashcroft alliance as final settlement for the acquisition of Belize Telemedia Limited (BTL) on or before November 10. Failure to adhere to the court’s deadline would incur interest of 8.34%.